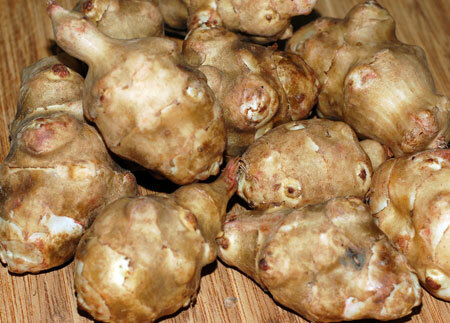 Sunchokes, also known as Jerusalem artichokes, are neither related to Jerusalem or artichokes. Actually, they are in the sunflower family; the misnomer arose from the Italian word for sunflower, girasole, which apparently sounded a bit like Jerusalem to untrained ears. What we now refer to as a sunchoke is a starchy tuber that is edible both raw and cooked, and looks inside like a crisp, pearly potato. Their exterior is rather ugly, very knobbly and can drive you nuts if you find it necessary to peel them; since the skins are thin and nutritious, I generally just scrub them and trim off the offending bits. Although sunchokes can be eaten raw in salads for a rather bland crunch along the lines of water chestnut or jicama, we prefer them cooked; they make an excellent secret ingredient in mashed potatoes, for instance, and have a lovely mildly nutty and sweet flavor. For dinner on Monday night, I decided to use them in a simple pureed soup, which also gave me the opportunity to break in my pretty new blender . 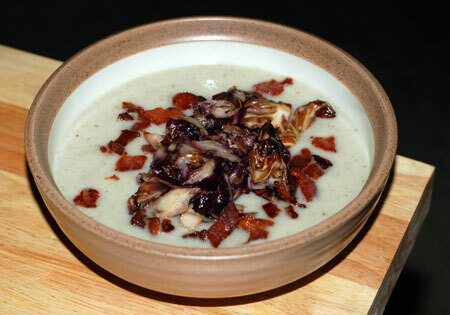 To give it my own twist, I garnished the soup with smoky bacon bits and a tangle of sauteed radicchio, which provided a needed bitter counterpoint to the slightly sweet sunchokes. It looks a bit like cement, but it was delicious and fairly healthy to boot: sunchokes are good sources of potassium and iron, and radicchio is full of antioxidants and folate, all of which are especially good for me during pregnancy. Melt the butter in a soup pot over medium heat. Add the onions with a pinch of salt and cook until translucent but not brown. Add the sunchokes and chicken stock and simmer until the sunchokes are tender when pierced with a fork, about 20 minutes. Remove from heat. Using a blender or immersion blender, blend the sunchoke and onion mixture with the cream until very smooth. Season to taste with salt and white pepper. Return soup to stove on low, just to keep warm; do not allow the soup to boil. For garnish: Cook bacon in a 10-inch skillet over medium high heat; drain on paper towels and remove all but a tablespoon or so of drippings. 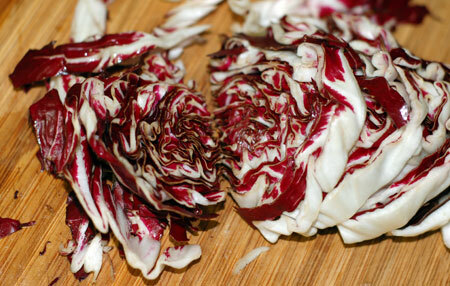 Add radicchio, season with salt and pepper, and cook until tender, about 5 minutes. Place soup in warmed bowls; deposit a small tangle of radicchio in the center of each bowl and sprinkle with bacon. Serve with rolls or slices of bread. Serves about 4. Leave of the bacon for my taste, but lovely pictures! If you like soups, you may want to try out my new soup challenge (well soup and sometimes salad, just to keep you paying attention!) No Croutons Required! Holler, with vegetable stock and sans bacon, I think this would be a very good vegetarian soup. I love soup, especially at lunchtime, so I’ll have to see if I can come up with something for your soup challenge.